The "father of China's hydrogen bomb," Yu Min, passes away at the age of 93 in Beijing on Wednesday. Yu, a Chinese Academy of Sciences academician was instrumental in developing the nation's hydrogen bomb in the 1960s. In December 2018, Yu became one of the 100 Chinese given medals as reform pioneers at a conference held in Bejing to celebrate the 40th anniversary of the country's reform and opening up. Yu once rejected being called the "Father of the China's Hydrogen Bomb," when interviewed by the Chian Central Television (CCTV), saying that "Such advanced national defense technology is the result of the efforts of thousands of people in their fields including engineering, science and technology." However, almost every Chinese individual and organization would insist on commemorating him and his great contributions. The hashtag "Father of Hydrogen Bomb Yu Min passed away" has gathered more than 34 million views as of press time on Sina Weibo. China tested its first hydrogen bomb on June 17, 1967, two years and eight months after its first atomic bomb test, setting a world record, much faster than the US which took more than seven years to develop the H-bomb after its first atomic bomb test. The US' first successful atomic bomb test took place in July 1945 and its first H-bomb was tested on Novermber 1, 1952. A tribute from the CCTV on Wednesday said Yu started to study theoretical physics at the age of 20 in 1946, and began his nameless research dedicated to the development of the country's first H-bomb in 1961. Yu's work since 1961 made pioneering contributions to the enhancement of China's national defense as well as the country's scientific and technologically independent innovation, the report said. 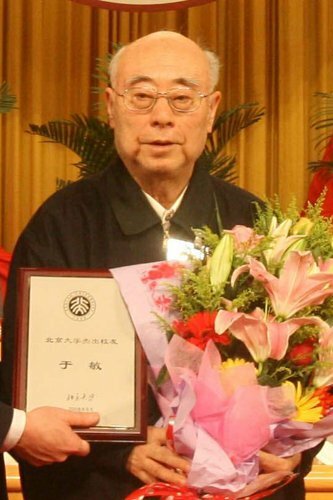 Yu received his first public recognition, the "Two bombs, One Satellite Meritorious Award" in 1999. In 2015, he was given the 2014 State Preeminent Science and Technology Award, the top national science and technology award. Only three "Two bombs, One Satellite Meritorious Award" scientists remain alive.